Frank, it's not uncommon for a cat to overgroom an area. The difficulty comes in ascertaining why this behavior is taking place. In most cases, the causes can be divided into two categories: physical and mental. Most instances of overgrooming are due to physical pain or discomfort. If that's the case for Amos, it can be difficult to pin down. If your current veterinarian is unwilling to take this symptom seriously, you should probably seek out a second opinion. There are any number of physical maladies that can cause a cat to overgroom an area. Amos may associate pain with the area that he's overgrooming. He could be trying to relieve arthritis or a skin condition or an insect bite. The physical issue could even be something as common as an allergy, In this case, your vet will have to help you determine the answer. We had a personal experience with overgrooming in the black cat you see in pictures here on our site. It turned out that she was overgrooming her lower belly because she had a urinary tract infection and bladder stones. She felt discomfort in her belly, so she soothed it the only way she knew how. Once we resolved her UTI and stones, her grooming behavior returned to normal. If the skin where Amos licks isn't broken, there's no immediate danger. However, if he does break the skin, he could be open to an infection. It's important that this behavior not be allowed to progress that far. If physical maladies can be ruled out, you can move on to investigating mental causes. In cases like this, the mental cause is usually stress. Overgrooming could be Amos' attempt to comfort himself. When cats feel anxiety, they often use their grooming routine as a way to calm themselves. It also helps with the distribution of scents and the creation of a "family" smell. You've probably noticed that Amos will sometimes lick an area that you've recently touched. That's his way of mixing your scent with his own to create a unique scent for the group, just like he'd do if he were in a group of cats. If the cause is stress, you'll need to examine Amos' recent history and try to determine what might be stressing him out. Have there been big changes at home? Is there a new pet in the house? Are there new people? Is another cat spraying outside where Amos can smell it? Any of these things can create tremendous stress for a cat. If you can locate the source of Amos' stress, you can help to alleviate it. First, make sure that Amos has safe areas that he can call his own. A bed on a closet shelf or a tall perch beside a window. Amos could just need a quiet place where he can go and feel secure. Once you've established such spaces, it's important that you never violate his safe zone by forcibly removing him. He should be made to feel that his new fortress of solitude is impenetrable. You may also want to purchase a small black light to check and see if any cats have been spraying outside your house. The sprayed areas will usually glow in the black light. See this post for more on the challenge of removing markings by other cats. Another culprit could be boredom. If Amos is home alone all day, he may be becoming very bored and stressed when no one else is around. You can help to alleviate this boredom by enriching his environment with the addition of new boxes or cat trees. Vertical space is very important for cats, and adding more is almost always a welcome change. 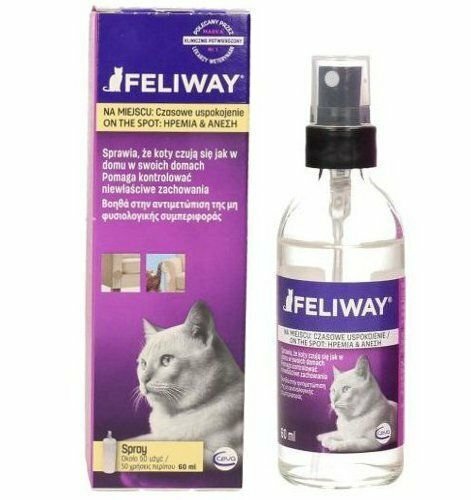 Stress can also be temporarily managed with the use of a synthetic feline pheromone like Feliway. We recommend using the manual spray bottle as opposed to the diffuser. That way, you can focus the spray where Amos most likes to be, including his safe places. You can also control how much you use and when. It's important not to rely on this quick fix, though, and attack the root causes of stress. The last thing you need is to make Amos dependent on Feliway. Frank, we wish you and Amos all the best in dealing with this problem. It may take a while to figure it out, but don't give up. We're certain that you can sort it out.